The during and after snap 3/4 dress is your must have dress of the season. Created in super soft jersey blend, with form-flattering ruche detailing, this comfy dress also features discreet nursing access via the snap front making it perfect for during pregnancy and nursing after. Gently ruched side seams lend this bump-flattering style to a form-fitting, 3/4 sleeve maternity dress. This easy to wear dress is the perfect date night or baby shower dress. Made from a wrinkle resistant knit, it drapes beautifully to help hide any bumps and bulges. The faux wrap with adjustable front ties makes it an easy pull-on style and the crisscross bust provides easy nursing access after baby arrives. 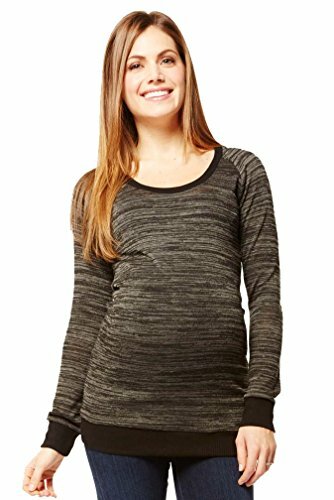 During and after long sleeve tee is the perfect top to wear during and after pregnancy. Crafted in a stretch jersey fabric, this top is designed with flattering ruching and snap front with pull aside nursing access. The during and after snap tee is your new must-have staple. Created in our signature super soft jersey blend, with form-flattering side ruching, this comfy top also features discreet nursing access via the snap front, making it perfect for during pregnancy and nursing after. A great sleeveless top with side pleating detail that allows for a growing belly or nursing functionality. In super soft jersey, we think this flattering top will become one of your summer must haves. The perfect throw on and go dress with a shirt tail hem and belted waist. Bonus points for the adorable ruffle neckline. Waist offers a flattering silhouette. This great cozy hoodie takes you through pregnancy and into nursing. An easy access panel allows for easy nursing access. Slightly longer length allows it to be worn with jeans or leggings. A perfect baby shower or date night dress, our birgit dress is made from a light weight, pliable, soft woven and is lined with a butter soft knit jersey. The handkerchief hem adds a flirty feminine touch while the tank straps on dress are each 1 inch wide to make the style bra strap friendly. A vertical open seam at center chest on top layer of printed dress provides pull away access to the nursing slit underneath for easy, discreet nursing access. Features: Wireless, SupportiveLightweight,SofttnessEasy to clip down the clasp for breastfeeding.Basic colors is easy to pair with other clothigWashing with cold Nursing tanksWearing it, lets your pumping journey become more convience! Wearing it,lets pregnant Angle's time become more comfortable. Wearing it,lets lounge time become happier!Every new mom must have. This nursing tank is designing both for Pregnant and Nursing. Easy to clip down the clasp and even one hand is able to get. Long enough to single wear or under the clothing,You can wear it under the shirts, dress and outfit. Whatever single wear or pair with other clothing, it will show new Mom charming perfectly. 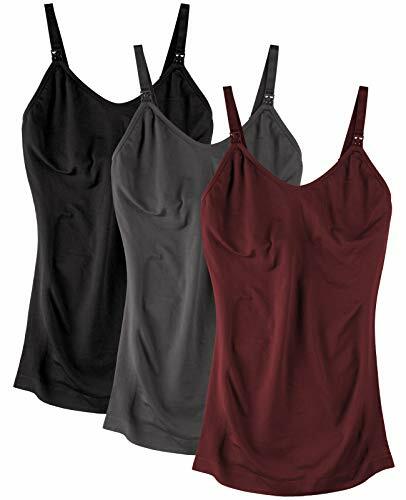 The nursing tank is ideal for your everyday active lifestyle.It's a great nursing bra choice for everyday. A contrast Ponte-knit bodice with a nursing-friendly surplice neckline lends bump-flattering style to a soft and stretchy 3/4 sleeve dress with a windowpane-plaid skirt for a graphic finish. Our take on a classic tank, the joey tank hugs your curves while the ruching offers figure forgiveness. With extra long length, this top looks great with jeans or leggings. Made in LA in our signature super soft, high quality jersey, you will never want to take this maternity tank off. The during and after snap tank is your new must-have staple. Created in our signature super soft jersey blend, with form-flattering side ruching, this comfy top also features discreet nursing access via the snap front, making it perfect for during pregnancy and nursing after. Stylish and comfortable, this fitted maxi skirt looks great dressed up or down. Pair it with your favorite fitted tee and flats for a casual look, or wear it with a flowy top and blazer for a dressier feel. A classic NOM style - our surplice maxi dress offers a flattering silhouette during pregnancy and nursing functionality for after. A hidden modesty layer means you can breastfeed without showing too much skin. A great during and after top that takes you through pregnancy and into nursing. Overlapping panels in front for discreet nursing access. Our summer sweater is the perfect day to night top to take you through your pregnancy. With a slim fit, this scoop neck sweater shows off your belly bump in all the right ways. Compare prices on Nom Maternity at LiveSaler.com – use promo codes and coupons for best offers and deals. We work hard to get you amazing deals and collect all avail hot offers online and represent it in one place for the customers. Now our visitors can leverage benefits of big brands and heavy discounts available for that day and for famous brands. We try to makes comparison shopping easy with Product Reviews, Merchant Ratings, Deal Alerts & Coupons. Find Deals, Compare Prices, Read Reviews & Save Money.